Database marketing is not the same as CRM. You can call it that, but it is rather like calling a terrorist a freedom fighter. CRM is aimed at making the right offer to the right person at the right time, based on massive data accumulated in a warehouse. No warehouse can hold the data on the behavior of an individual that is needed to make CRM deliver profits. The warehouse needs to know what the customer is thinking, what his values are, what he did yesterday, and what he wants to do right now. CRM is a nice idea that does not work in practice, and wastes millions of dollars on an impossible quest. Instead, what works is database marketing, which is essentially aimed at divining the behavior of customer segments, and designing marketing programs for the segments. This process is economically possible, and can be highly successful. Database marketing is incremental. Database marketing is a channel for exchanging information with customers. For database marketing to work, there have to be other channels that are delivering the basic sales: mass marketing, retail stores, catalogs, interactive Web sites, salesmen, distributors, agents, outbound telemarketing, and direct mail. Database marketing makes incremental improvements in customer retention rates, response rates, referrals, cross sales, frequency of sales, and average order sizes. It builds relationships with customers that bind them to your company and your brand. Done right, database marketing makes customers happy and gives them a feeling of identification with you, your products, your company, and your employees. It helps prevent defection. The Internet has enabled database marketing to deliver on its promises. The idea was always to use the database to communicate with customers and make them happy. But direct mail and telephone communications are so expensive in relation to the good that they do that they can be used only sparingly. E-mail to customers is almost free. It is instant. It can be highly personalized delivering up to the minute information. 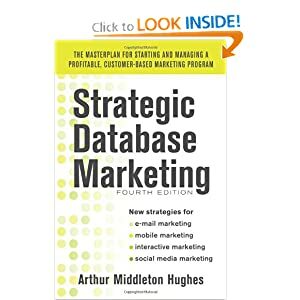 It is the best thing to hit database marketing in the last 20 years. The Web is not a selling medium, it is an ordering medium. An entire industry based on Web advertising and sales was created, wasted hundreds of billions of dollars, and then died within five years. What did we learn from this? The web is a passive medium, not an active one like television, radio, telemarketing, direct mail or retail stores. Neither is it a very powerful advertising medium. People will buy products and services over the Web, but they have to be stimulated first by something else: catalogs, direct mail, or mass marketing. As an ordering medium, the Web can be superb. It cuts the cost of a customer contact down by $3 to $7. It can be tied to a database and customized so that each customer sees something different when he/she clicks onto it. But that customer is unlikely to click there without some outside stimulation. People like communications. The heart of database marketing is not the database itself, but the customized and personalized communications with customers that are created using the database. Communications work. They keep customers from defecting. They make people happy (and angry as well). They help to sell goods and increase loyalty, referrals, cross sales, frequency, and order size. Without an active and creative communications program, the database is worthless. Everything in database marketing can and should be measured. Whenever you design a new strategy, program, or communication, you must set aside a control group that does not get the gold cards, communications, newsletters, offers, discounts, premiums, or special services that are being extended to your test group. This is the only way that you can know and prove to management that your expenditures for database marketing are producing a positive return on investment. If you are not constantly testing new ideas, setting aside control groups, and measuring, you are not doing database marketing. Lifetime value is the key database marketing measurement technique. You must learn how to compute customer lifetime value (LTV) and use it in evaluating and designing your marketing strategy. LTV is a forward-looking concept that includes the spending rate, discount rate, retention rate, referral rate, product costs, and marketing expenditures. It is the only way to know how much to spend on acquisition and retention. It is an essential step to use in getting your marketing budget approved each year. Database marketing is not about discounts. Discounts are used in mass marketing campaigns, and they work. They don’t work in database marketing. Why not? Because the basic idea in database marketing is to build a close personal relationship with each customer that is based on quality, service, friendship, loyalty, and communications. You would not give a neighbor $5 for helping you carry a chest of drawers up your stairs. It would be an insult. Instead, you offer a cup of coffee or a beer, and 15 minutes of chat around the kitchen table. That is the kind of relationship that database marketing creates. Discounts send the wrong message: we are cheap guys whose basic product is overpriced. We want to buy your loyalty. We don’t care about you. We care about your money. Customers should not all be treated alike. Some of your customers are gold. They deliver huge sales and profits. Many customers in many companies are actually unprofitable. Why work to retain the loyalty and sales of an unprofitable customer? What should you do? First, create customer segments, and learn who your gold customers are. Create special programs and services just for them that promote their retention. Study the segment just below the gold customers. Create programs to get them to move up. Study your bottom segment — the worthless people. Figure out how to re-price their services so they are profitable, or how to get rid of them altogether. If you treat all customers alike, your service budget will be stretched so thin that you will be unable to use it to modify customer behavior. Caller ID and cookies have become essential database marketing tools. Caller ID is used by customer service to recognize customers, call them by name, and see their history with the company on their screen before they even answer the phone. This type of recognition builds relationships and loyalty. Cookies are used the same way on the Web. Web sites are configured differently for each repeat visitor, based on their expressed preferences on the previous visit. Cookies build relationships and loyalty. Many customers will gladly give you their profiles over the Web. What is a nuisance on paper or over the phone becomes a fun exercise over the Web. The profile can be used by the marketer to learn more about customers, and provide them what they want (as opposed to what you want to sell them). Profiles open up an entirely new and productive channel for customer contact. Marketing databases today are stored in a relational format on a server accessed by marketers over the Web. Many different marketers can access their company customer database simultaneously using IDs and passwords so that they see only the data that is needed for their position. Because of the Web, the database can be used by remote offices, salespeople on the road, and even overseas branches of the company. Another advantage of the Web as an access tool for marketers is that the marketer only needs to have a browser. He/she does not need to have any database software on his/her PC. Becoming customer-centric is seldom an achievable goal. For the last decade, marketers have talked about shifting their company from being product- and brand-centric to being customer-centric. “Don’t sell products. Find out what customers want to buy and sell them that.” This is a wonderful idea, but few are doing it. If we were really to become customer centric, we would segment our customers and create a manager for each segment. These managers would have higher authority than brand or product managers. In most cases, it does not work; the compensation system within a company is very difficult to arrange. If the silver segment manager does a good job, many of his customers will become gold customers, and he will lose them. How do you incentivize him for that? Before you mouth platitudes about becoming customer centric, think it through. See if you can make it work on paper. It won’t. Forget it, and do a good job of database marketing within your current organization. Database marketing is a method of making incremental increases in retention and sales conducted through other channels, but it is also much more than that. It is a way of making people happy. People like to buy products and services. They like to establish personal relationships with their suppliers. They like to be recognized, thanked and chatted with. They like to receive wanted communications. You can do all of this with database marketing using the web, phone and direct mail. You cannot do these things with mass marketing. Merchants used to recognize customers and communicate directly with them in small retail stores, but most of those using database marketing today are not proprietors of small retail stores. What successful database marketing does is to bring back the close personal relationships that used to exist between customers and local stores, and have been lost as our country and economy have grown.